The Stuart Jackson Gallery specializes in antique Japanese woodblock prints (Ukiyo-e). 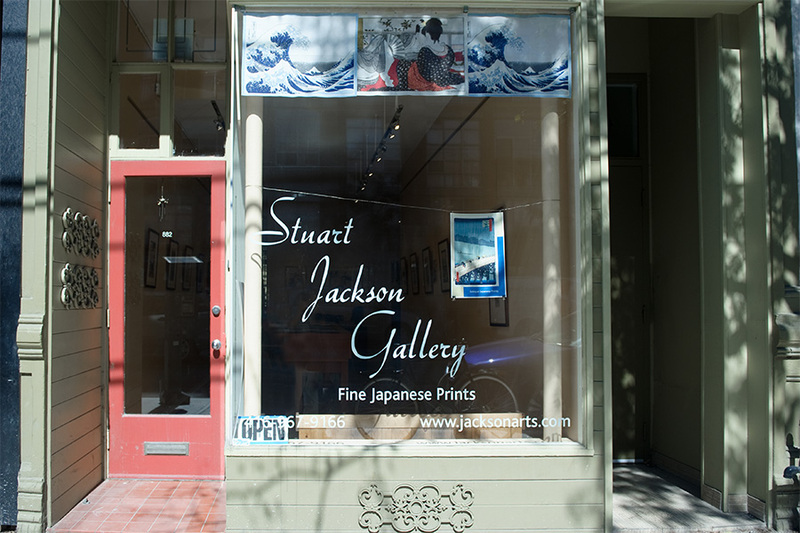 The Stuart Jackson Gallery is the oldest gallery dealing in Japanese Woodblock Prints, Ukiyo-e, in Canada. After over 38 years in the Yorkville area, the Stuart Jackson Gallery has purchased a wonderful gallery space at 882 Queen St W, backing onto Trinity-Bellwoods Park, which opened to the public in January 2013. The gallery hours are Tues-Sat noon – 6PM or by appointment. Ukiyo-e, meaning ‘pictures of the floating world’, was the most popular art form of 17th -19th century Japan. ‘Ukiyo’ was a Buddhist term referring to the melancholy transience of life. The concept was punningly altered to mean the fleeting pleasures of everyday life. Ukiyo-e depicted these pleasures, primarily through the medium of Japanese Woodblock Prints. The pleasures that were most commonly illustrated in Japanese Woodblock Prints were: the theater (Kabuki, Noh, etc); beautiful women; and the enjoyment of the natural world (landscapes, nature). Other subjects included shunga (erotica); current and historical events, legends, and more. The Japanese Woodblock Prints style began in the 17th century with simple black and white prints which were occasionally hand tinted. One or two color blocks were added to the printing process during the first half of the 18th century and by 1765 full color printing had developed. By the mid 19th century the printers art had reached its pinnacle with such subtle innovations as shading of colors, metallic pigments, and embossing. The talent and innovation of the 18th-19th century Japanese artists combined to create color print art of unsurpassed beauty and technical merit.